The stars were out in Culver City for Education on Saturday night. The 5th annual Spring Break-Destination: Education was City Year's largest fundraiser to date, raising $1.5 million to support City Year’s work with students at risk of dropping out. The carnival-style party open to teens, tweens and adults, attracted a star-studded crowd with more than 1,400 attendees all together. 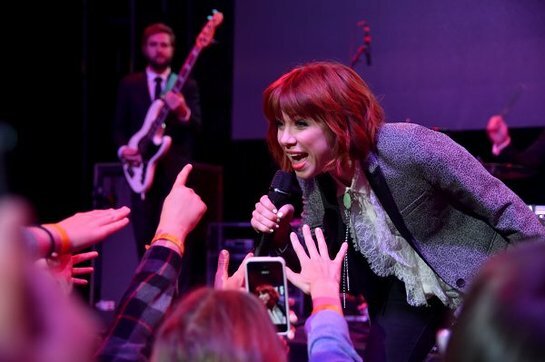 The night also included a special performance by Carly Rae Jepsen and Jasmine V, as well as food, games and interactive booths sponsored by brands like ArcLight Cinemas, Bain Capital, Disney/ABC Television Group, DreamWorks Animation, the Entertainment Industry Foundation, JCPenney, NBC, People, RealD, and Twentieth Century Fox, among many others. City Year is a national education-based nonprofit organization that helps high-need urban schools keep students in school and on track to graduate. Currently 288 City Year AmeriCorps members serve in 25 high-need schools in Los Angeles.